There are two things I concluded when meeting Jerry Jones at a rehearsal for the Norristown Chorale. One, this Skippack resident doesn&apos;t look at all like an 80 year old. Two, he&apos;s got a great sense of humor: As he stuck out his hand to greet me, his blue eyes showed a certain twinkle as he said, "I&apos;m Jerry Jones... and I do not own the Dallas Cowboys." Conducting the chorale is Ross Boerner, who has been in charge since 2012. 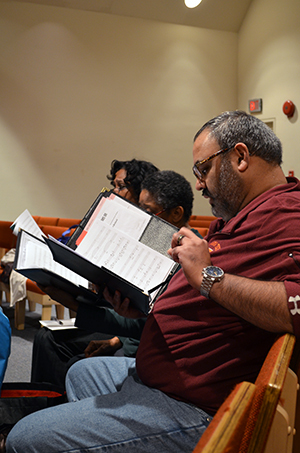 For the past 12 years, he has also been director of music and organist at the First Baptist Church of Norristown. 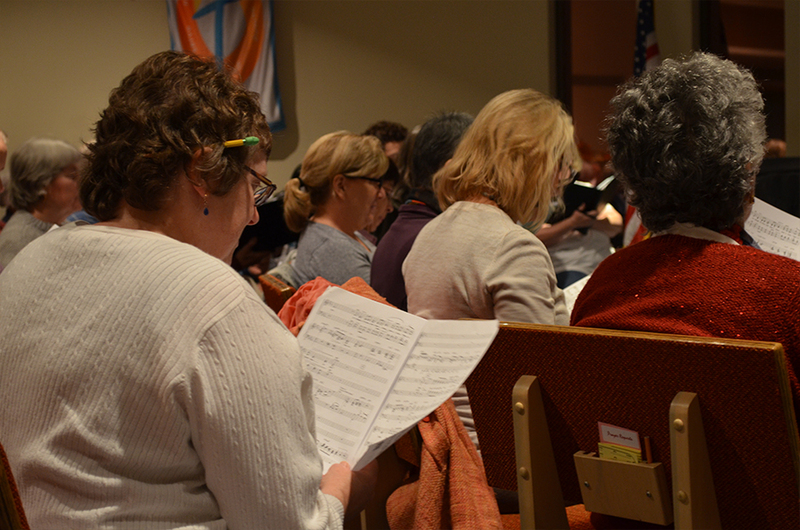 As the singers assembled, sitting in clusters based on voice parts (soprano, alto, tenor, bass), Boerner was riffling through a box of old music scores, courtesy of a colleague at another church. Captivated by the treasures that the box held, he laughed, "These will keep me up tonight looking through." The group settled and the work began in earnest. Boerner reminded his volunteer vocalists of the short timeframe until the performances. "I know we&apos;ll make it; I know we&apos;ll be terrific. But I also know that this is the last chance to really grunt out the notes in the program," he said. The program&apos;s two divisions address the secular and popular aspects of the holiday. The opening pieces are all about Mary and Joseph, and in the second half, the focus is snow, Santa and mistletoe. Boerner&apos;s warmups had the choir standing and "sighing." He instructed the members to take a deep breath and moan from the top of their range all the way to the bottom. A few of the basses took the opportunity to exercise merely their lower notes. Boerner chuckled at the result: "Basses, try a little higher. We need to get you out of that ‘ugghhh&apos; sound." After a few more vocal calisthenics, the singers sat and work began in earnest. The arrangement is full of resonant harmonies, and the chorale navigated them expertly. After the last phrase was delivered - "...Merry Christmas, to you." - Boerner cut them off with a sweep of his hands and smiled. "I love those luscious altos," he commented. Some of the vocal lines within "...folks dressed up like Eskimos..." were a bit tentative, and Boerner had pianist Laurie Mueller review the passages. "I like that there are circles going on," Boerner said, noting the number of singers who were marking up their scores in pencil, a technique helpful in not repeating mistakes. Moving on, the next piece was an unusual arrangement of Silent Night. The text weaves together German, Spanish and Korean, before taking a turn into Zulu. The effect was captivating, as the melody lines echoed each other across the different languages. Along the way, Boerner found it necessary to give only one pronunciation correction: "That&apos;s a hard ‘g,&apos;" he reminded, regarding a particular Zulu word. "Like in ‘giddy-up.&apos;"
Veteran singer Jones navigated well from his seat amid other tenors and basses. During a break, he filled in some of his backstory for me. He came to the Chorale by way of a singing group associated with the retirement community in which he lives. 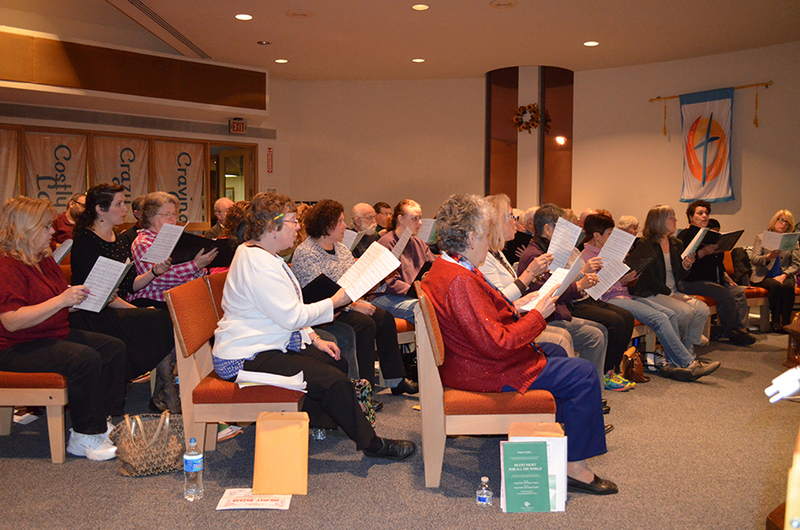 "Some of my friends were singing here, as well as with our singers in Skippack. When my wife passed away, I thought it would be a good idea for me to join. It gives me something to do, something that also gives back. I&apos;ve been singing all my life, and I&apos;ve enjoyed it all my life," he says. Admission to the Norristown Chorale&apos;s 2015 Christmas concert - entitled "Come on! It&apos;s Christmas!" - is free, but a good-will offering will be taken to support costs. After the performance, the audience is invited to attend a reception prepared by Chorale members and their families. 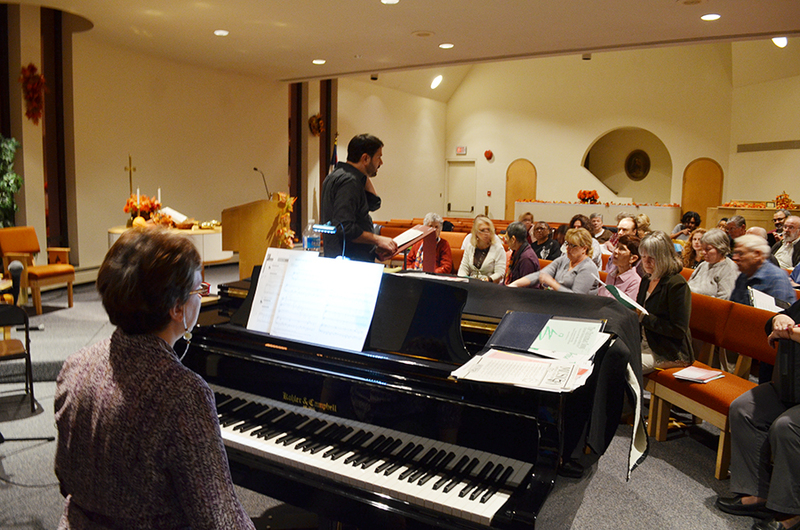 Montgomery County residents wishing to join the Norristown Chorale, and perhaps a seat in next December&apos;s holiday concert, may contact the organization through its website.